18th century Venice; where Hollywood meets Las Vegas; where the jet-set of Europe could conceal their identities behind masks and hurl themselves into the fake world of commedia dell'arte. 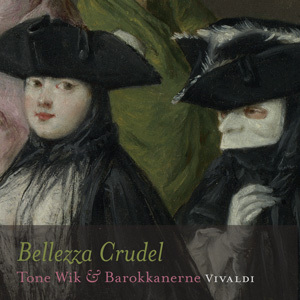 Bellezza Crudel is a small selection of delightful cantatas and concertos. Vivaldi's world is one of heartfelt, musical intensity, confirming the Venetians' adoration of theatrical beauty. Antonio Lucio Vivaldi was buried on July 28th 1741 in a pauper's grave in Vienna. Although he had been a famous musician, receiving commissions from courts throughout Europe, and his music had been transcribed and copied far and wide, he died a poor man in a foreign country. Both Vivaldi and his music were soon forgotten. It was only in the late 1920s that he was rediscovered. His music library was uncovered in two private collections, and was sold to Biblioteca Nazionale di Torino. This rediscovery laid the foundation for his astonishing revival. In Vivaldi's time, Venice was a place of cruel beauty; its glamorous exterior concealing a hard and brutal reality. The Republic had long lost its leading position both politically and economically. The decay and decadence were epitomised by the notorious state-run casino and the carnival celebrations, where masks could be worn and one could live incognito. In this environment of ritualised sensuality, Vivaldi experienced ever-increasing success for himself and for his innovative compositions, and soon he was fêted far beyond the borders of Venice. However, towards the end of the 1730s, his good fortune changed and his musical career imploded. Was this due to the fact that he was no longer in favour with the taste of the time? Or due to allegations about an unseemly relationship with the prima donna Anna Girò? Was he irascible, or was Vivaldi simply no longer newsworthy in a world dominated by superficial dandies? The reasons for Vivaldi's sudden departure, selling his compositions and moving to Vienna, will probably remain a mystery. However, "il prete rosso", as he was known, and his now popular music will continue to delight new and existing audiences and performers worldwide. Vivaldi's importance as a composer of vocal music has only recently been recognised. His concertos have, in their many variations, dominated with an outpouring of recordings and performances. The increasing interest in his vocal music is resulting in a new and exciting repertoire, which sets his instrumental music in a wider context. 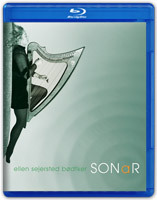 International release in January 2009. 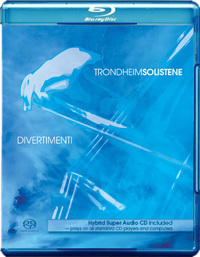 Available in selected web shops by December 12th 2008. Preview at 2L.MusicOnline.no and make your pre-order now! !